When Erin Cox of Why Not Sew? asked me to participate in her book blog hop....of course, I said YES! I have known Erin for years and have long admired her adorable projects! Writing a book and sharing her ideas seemed like a natural next step. And, boy, I am so glad she took that step! Sweet Tweets guides you through using raw edge applique and a technique called sketch applique to create sweet projects. 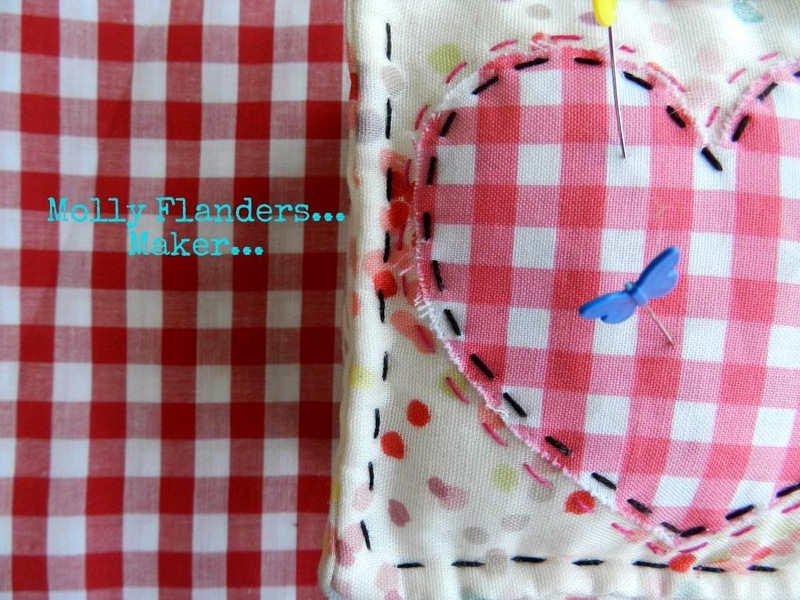 Erin includes tips on preparing the applique, which foot to use for sketching, and oodles of projects to make! But you aren't limited to just the projects in the book. This book is a great jumping off point for using the templates and techniques to create your own sketch applique project! to make a pretty 'tweet' pencil pouch for a special little girl! I added a fun yarn fringe pull! I can't wait to give it to her! If you would like to win your own e version of Sweet Tweets...leave a comment here! I will choose a winner on Saturday September 27th at 10 pm EDT. Good luck! Beautiful pencil pouch, that little girl will love it! I adore the yarn fringe pull! All of Erin's projects are so cute! I love your adaptation in your pencil pouch. I love the little birds, so sweet. Love the fringe pull. A great idea. I love what you did with the heart and birds. Very cute design! What an adorable pencil case. Won't that lucky little girl be thrilled! I'm new to your blog, so I'll go take a look around. These projects are just so cute. the black outline of the birds is distinctive. This technique looks like tons of fun! I have never tried anything like it. Time to break out of the box. Love your little bird pouch. What a super gift. I would love to win the book in your Giveaway as I have admired Erin's cute bird projects for a very long time. Love the idea of sketch applique! Thanks for the chance! So from the little birdies you can go to butterflies and kittys!!! What a lucky little girl - love your design. This sketch applique is awesome - really adds to the piece as a whole! Thank you for participating. I'm an admirer of all of Erin's projects! I love your pencil pouch and the yarn fringe is an adorable idea!. Such a sweet pouch! Love how you made up your own idea! Any little girl would love your pouch! The yarn tassel makes a fun zipper pull. I love the little pouch. The ric rac is a great added touch. Cute pouch and perfect for the tweet design. I sure would love to have this book. Thanks. I'd LOVE a copy! Your little pouch looks so sweet. Your pouch with the fringe is so cuts. Thanks for sharing it. The pouch is wonderful, perfect for a little girl! Gorgeous - I love your birdie pouch! HI, so cute! Thanks for sharing! The projects are all so cute! Would love to win a book. Browsed your website and especially the tutorials. What great projects you have done. Nice to see your adaptation of the Sweet Tweets pouch. If I don't win the book during this promotion, it will be on my Xmas list for sure. swalker287 (at) aol (dot) com. Love your little pencil pouch! I know several little girl's that would love to have one. Thanks! I would love to win a copy of this book. So many fun projects. Thank you! Beautiful pouch!!! Those birds are lovely. I love this type of raw edge applique. The birds and hearts make it irresistible! I hope I win!!!! Absolutely adorable! Love it! Thanks for the chance! What an adorable pouch and a cute book!! Your pencil case is really cute and those little birds are very endearing! Oh my gosh!! Your are so Creative!! Your Pencil Pouch is AWESOME!!! Lucky lil' Girl is going to LOVE it too! Your pouch is so stinkin' cute. I wish I could give it to my daughter. The fabric is just perfect. That pencil case in adorable. I love your pencil case. OOOOh yes. Please. I love the little birds and I'd love to push the envelope on my applique skills. I think the little birds are so sweet. Aloha, I love the little Pencil bag !!! It would be fun to win this darling book to learn some new things. Oh my gosh, they birds are so 'tweety' !! Can you imagine them done up as bunting with old lace doiles - awesomeness yes!!!!!! Sweet pencil case. I'm really tempted to try the sketching. Hi Molly - these are the cute little projects that I never seem to make. Thanks for the inspiration... not I must do it! Love your pouch and love all those sweet birdies! Such a cute pouch. I would love a chance at winning this book. The more I see of it the more I want/need it! So sweet it will make a great pencil pouch! Love those Birdie ideas. I would make cute mug rug for my daughter's October birthday. Would definitely love this book! Cute! I love little birdy projects! I would love to win this sweet book! Thanks for the chance! This book looks interesting and that teeny tiny birds pouch is a delight!! such a sweet little project, and a beautiful book! Oh I love your little pouch! The fabrics are just perfect! Thanks for the chance! The pouch is so cute and so is this book! I love this idea! I usually do hand applique, but I would love to give this a try. I love your pouch! Such a cute pouch! This book looks awesome!